For most of the last decade, Paul was gone on Friday and Saturday nights. Before Sadie was born he worked 48 and 72 hour shifts at a group home, which meant sometimes parts of weekends were free, but often times he was gone. After that he began grad school, with a program that took him almost 300 miles away on weekends (besides working nights during the week). Then law school began and between studying in the law library, and then working as a doorman the last two years of school on just about every weekend, he was hardly ever home on Friday or Saturday nights. This last year, when he started his own business he kept working as a doorman on weekends. I was pretty elated when he got the new job and I discovered that for the most part, on Friday nights, Paul will be home. And so I finally declared Friday "Family Fun Night" and began planning. The nights usually include a meal I know they'll like. 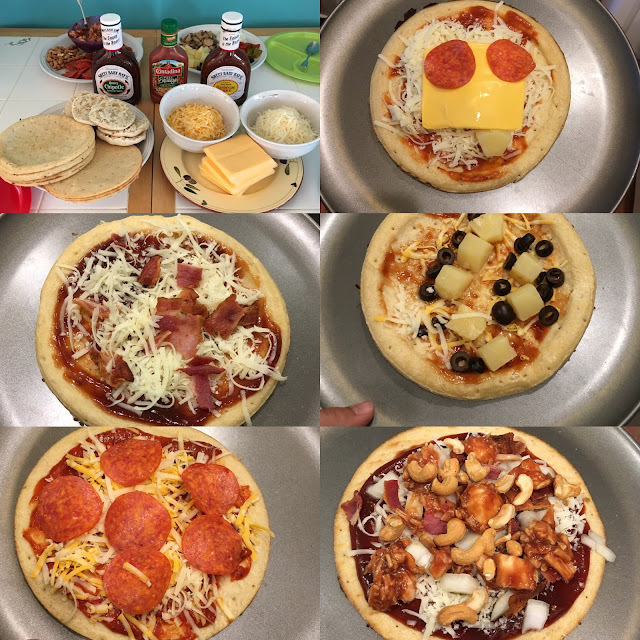 When I'm feeling really energetic I plan something that the kids can help make, like pizzas that they can decorate, or banana floats that they can help build. On other nights (like kebab night) everyone else was out in the living room while I threw everything together and brought it out. 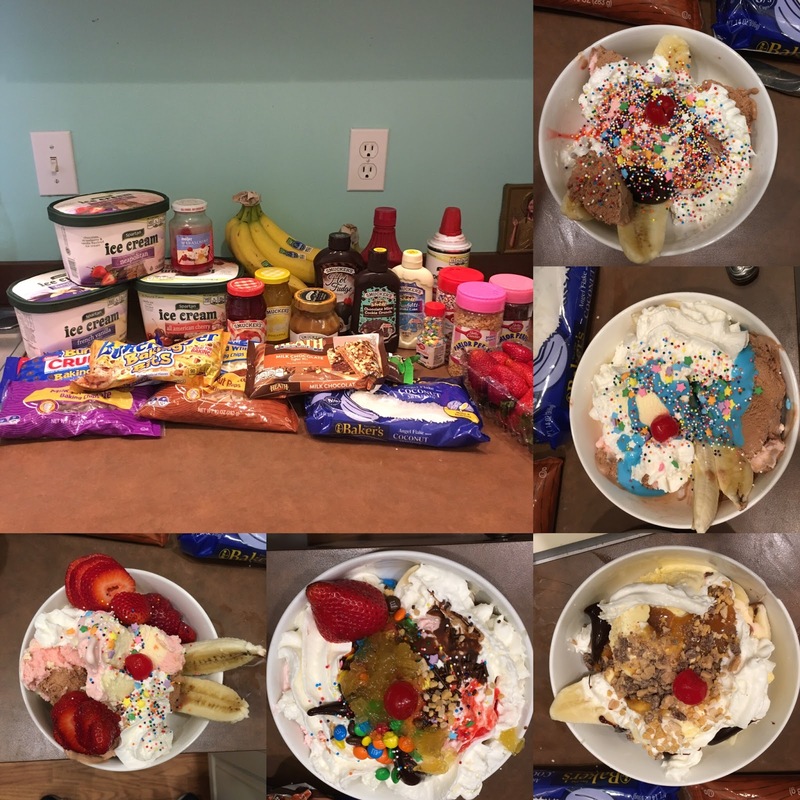 Banana Split night, barely beat out Root Beer Float night as the kids' favorite. It was unique in that instead of being dessert, the banana splits were dinner. It only happens once, or maybe twice a year, but it's definitely a memorable night for everyone. And it was fun to see which toppings everyone picked for their creation. Family Fun movie time has convinced me that it would be very, very nice to have a sectional down in the basement. Because right now there's a huge amount of competition for the "best" spot on the couch. And on the floor. And I don't think I've ever been more grateful for Pinterest for ideas, even if our nights aren't quite Pinterest worthy in and of themselves. They are definitely fun. These are the memories they will carry with them. How fun for all of you!! We've had pizza and a movie every Friday for about 7 years now. We make our own pizza dough! A few years ago, we bought a second hand proyector and now proyect the movie on the wall right in front of the couch. Luxury, I tell you. The children *love* it and they really miss it if there's a week we can't do it for watever reason. Look at that ice cream bar! It's fun to be a Wollner kid!!! Just curious-- was that special ice cream or does Maggie not need to follow her dietary restrictions any more? That does look like a super fun dinner though-- it reminds me of when I used to get pancakes for dinner on Sunday nights as a kid :) Great memories. A little while after we moved I bought apple chips, which were made by a company we'd bought a bunch of gluten free stuff from, without realizing that these weren't. She had them in her lunch all week and was completely fine. After we discovered it, and discovered that she hadn't had a reaction (in the past when she'd get into anything the reaction would be so bad that even when I forgot to mention it at therapy they would know and would contact me to ask what happened) we started reintroducing it and then tested out milk too! So for almost a year she's been back to a normal diet and has been fine. 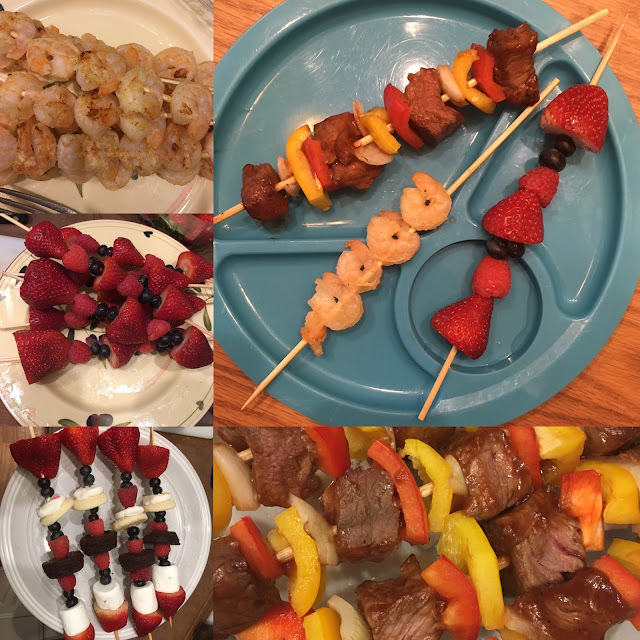 It all happened around the same time that both Sadie and Patch's allergies suddenly disappeared from the tests at the allergist's office, which happened to be a couple of months after we moved out of the old house. I was always battling mold in the basement there, and it honestly makes me wonder if there was something in the house that made everyone sick/made immune systems act strangely. I don't have any proof, but I definitely wonder because it seems like we all felt so much better once we moved.